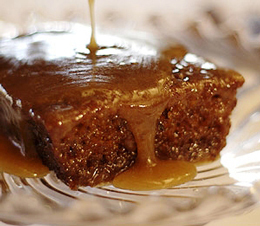 Sticky toffee pudding with a salted caramel sauce - home cooked food delivered. Who wouldn’t want to eat this classic with our surprising twist, Newcastle brown ale marinated dates!! Either cover with foil and oven bake for 8-10 minutes in a medium oven, or microwave on high for approx. 2 minutes. The sauce should be reheated in a sauce pan till bubbling. keep refrigerated. best used with 5 days. Suitable for freezing.